This memorial column, erected in the early years of the 18th century, is the most outstanding example of a type of monument specific to central Europe. In the characteristic regional style known as Olomouc Baroque and rising to a height of 35 m, it is decorated with many fine religious sculptures, the work of the distinguished Moravian artist Ondrej Zahner. 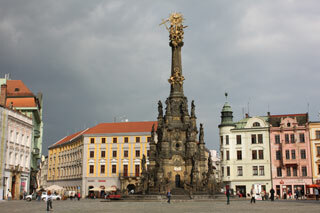 This article uses material from UNESCO World Heritage List article "Holy Trinity Column in Olomouc", which is released under the Creative Commons Attribution-Share-Alike 3.0 IGO License.